This event is specifically designed to help families understand how everything is handled from the farm to the table. Kids will also enjoy the petting zoo, and there will be blacksmith demonstrations, as well. Hours: 9 a.m. – 5 p.m.
Local bands will be on hand to perform music as the backdrop to pioneer-era crafting demonstrations. Hours: 9 a.m. – 5 p.m. 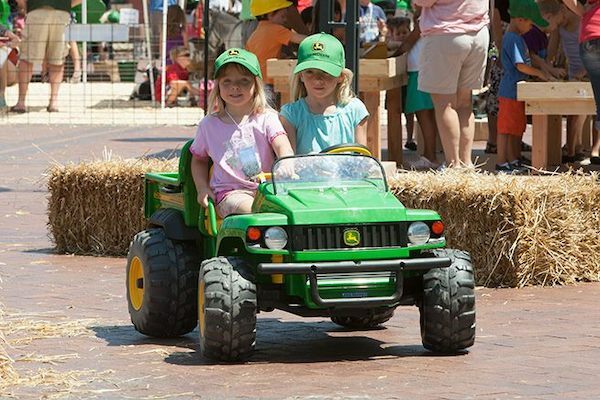 This event includes a petting zoo for kids, a pedal tractor pull, gator obstacle course, and activity tables for little ones. Hours: 9 a.m. – 5 p.m. Hundreds of vintage John Deere tractor owners will be on hand, displaying their collections at the historic site. Hours: 9 a.m. – 5 p.m. Throughout downtown Moline, heritage tractor owners will ride their machines to give onlookers a closer look at John Deere throughout history. Hours: 9 a.m. – 5 p.m. This celebration includes pumpkin decorating, bobbing for apples, and covered wagon rides. Kids will also enjoy visiting farm animals. Hours: 9 a.m. – 5 p.m. Kids will have the opportunity to meet Santa Claus, and families can make crafts and enjoy the sounds of the season as performed by local choirs. Hours: 9 a.m. – 5 p.m.